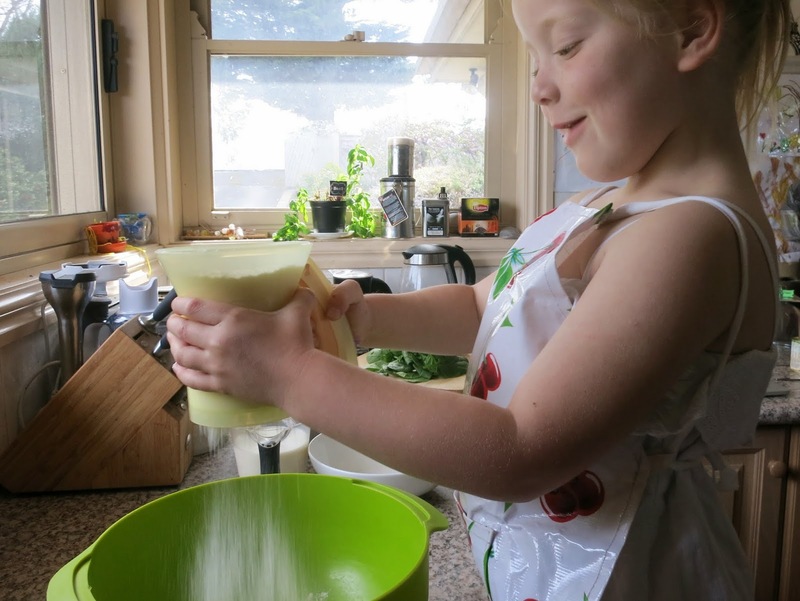 When cooking with kids, it's good to get your ingredients out and ready in a way that makes it easier for them to access and follow instructions. It gives you an opportunity to talk about the ingredients and quantities before you start. Don't forget to pre-heat your oven and prepare your muffin tins (we spray lightly with vegetable oil). While they are still warm, cut in half and serve. They are delicious with a little spread of butter. Once they have cooled completely, you can freeze them for other days. They microwave well for a quick warm snack or sent off to school in the lunchbox. 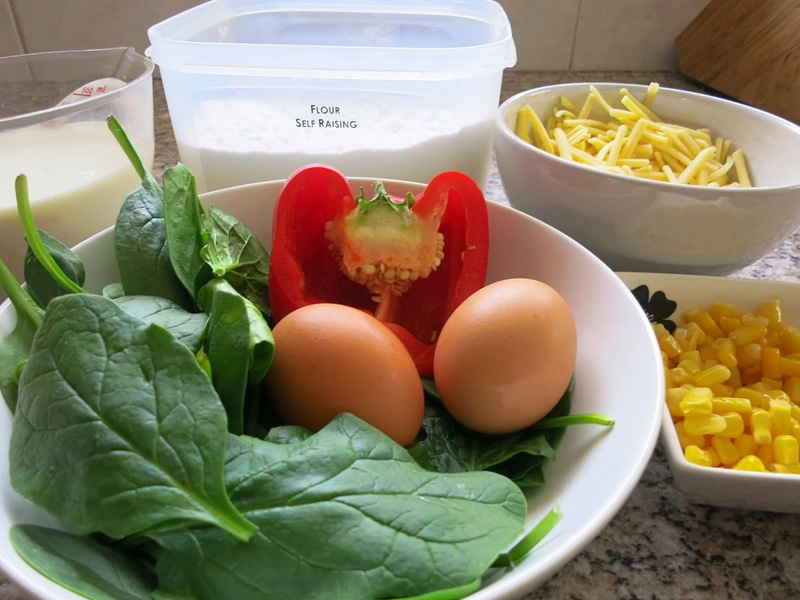 Whisk eggs, chop capsicum, spinach (and optional basil). Make a well in the flour, add in the rest of the ingredients and mix until combined. Spoon into a greased muffin tray (pop a basil leaf on top of each, optional) and bake for 25 minutes or until the tops are golden brown. Makes about 14 regular muffins or 12 large ones. If you don't have Self Raising Flour, you can substitute with Plain Flour and Baking Powder. Use 2tsps of baking powder per cup of plain flour. 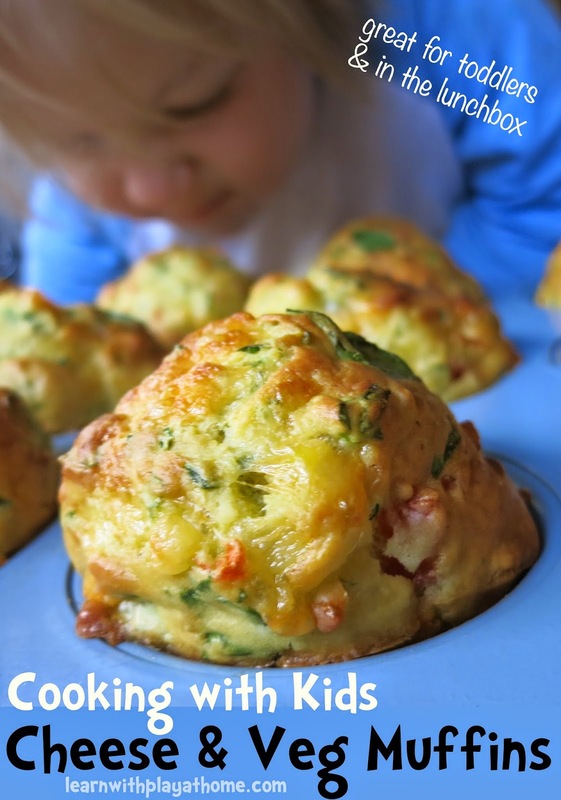 Mix and match the veggies used in the muffin to create your own favourites. Other veggies that work well are mushrooms, tomato (fresh or sundried), zucchini, broccoli, spring onions, etc. Swap some of the tasty cheese with some crumbled feta cheese for an extra cheesy bite. They will keep for up to a week in an airtight container in the fridge however, any that I'm not going to use on the day of making or the day after, I freeze to keep fresh. They defrost in a lunchbox in time for lunchtime or you can microwave them for around 30 seconds for a soft, warm muffin. Found this on Pinterest and gave them a try. I doubled the recipe, but only added 2 cups milk. Also heaped the corn, added peas, onions, and a scoop of Greek yogurt. Turned out very good! I put most of them in the freezer and I plan to put them in my lunches. How did you store them? I think I will put the rest in the fridge to keep fresh wih the cheese and eggs. Maybe heat them up when I want one. Would love to try this but unsure what you mean by cup size. how large are the cups grams wise? ?